L. Rustius was one of the moneyers for the year 76 BC. He is not otherwise known, but is presumed to hail from Antium. 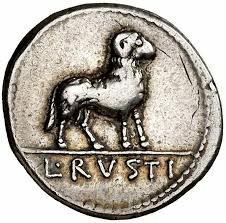 Gens Rustia is virtually unknown, save for two moneyers; L. Rustius in 77 BC and Q. Rustius in the time of the empire.